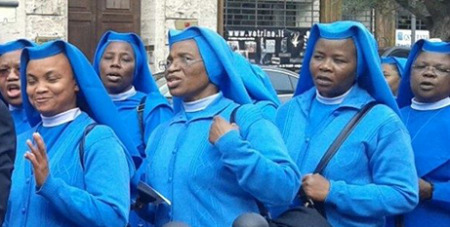 Religious sisters in Nigeria say that fear of abductions is not stopping them from carrying out their responsibilities. Source: Vatican News. “It is frightening … but what can you do? It is not stopping us from carrying on with our responsibilities,” said Mother Mary Claude Oguh, Superior General of the Sisters of the Immaculate Heart of Mary Mother of Christ. Christmas and New Year festivities passed without a significant incident targeting the Church or its personnel, although Boko Haram terrorists launched a series of attacks in the northeastern part of Nigeria during that time. In recent years, priests and religious women have become targets of abductions in Nigeria. Criminals kidnap religious women and priests on the assumption that congregations or dioceses will pay a ransom for the release of one of their own. Mother Mary Claude said she has not changed any of her work routine in spite of the kidnappings. She still travels to visit her communities spread throughout Nigeria but the sisters do not go about putting themselves in harm’s way, she said. Consecrated women try to be security conscious and prudent as they go about their daily chores. And so they continue to work, travel and get on with their lives and apostolates.